I can't seem to get Dolphin 4.0-4873 to recognize my Mayflash adapter GC controller. The controller settings just say "Adapter not detected." 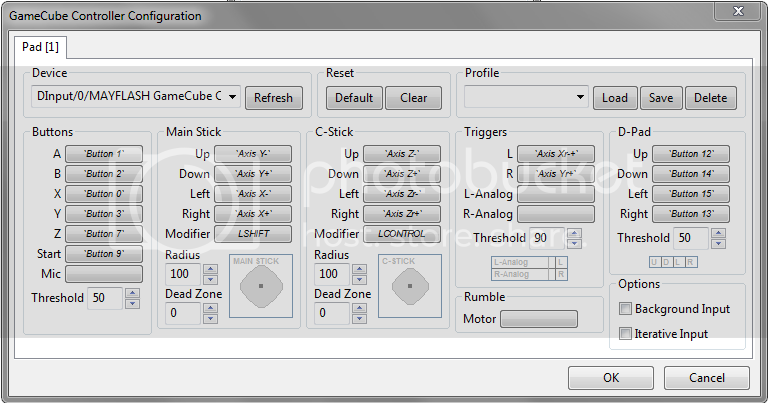 I've tested the inputs in the Windows game controller settings and everything works fine there. Does anybody know what the issue might be? Any help would be appreciated, thanks! I just got mine, took me quite awhile too figure it out. Just plug in the adapter. Plug in the controller into adapter. install mayflash driver on their main website. open dolphin, ignore the adapter not detected. set controller to standard and configure buttons accordingly. That checkbox is for Direct Input adaptor support (maybe could be labelled better). Blank page. I got mine working fine eventually after fiddling with the touchy trigger axes, but hopefully the devs can add native support like the Nintendo one. They have added native support like the Nintendo one. The trick is that you need to have the switch flipped to WiiU instead of PC. Also that page isn't blank, it's just that the forum corrupts the link for some reason. Go find the proper page from the general wiki link and you'll see it there. (03-12-2015, 02:33 AM)FenrirWolf Wrote: They have added native support like the Nintendo one. Worked perfectly! Thanks for the info... I assumed that driver replacement was only for the official Nintendo-branded adapter.